A popular use for cancer wristbands is to raise funds and create awareness against different type of cancers including breast cancer, lung cancer, prostate cancer, leukaemia and ovarian cancer. Wearing specific coloured awareness wristbands helps bring awareness against each type of cancer. Cancer awareness bracelets from Make Your Wristbands are made of comfortable and durable silicone which is non-allergenic, water resistant and long-lasting. Often, people choose a specific colour to support a cancer type when selecting their awareness wristband colour. You can also do the same for your cancer personalized wristbands, as you have the option to choose from our wide range of wristbands. Make Your Wristbands is a leading provider of custom silicone debossed wristbands available online, including awareness wristbands and cancer bracelets. Most importantly, we believe that our wristbands are your wristbands. Our friendly and professional customer service agents would help you to get your cancer wristbands easily customized so that you can raise awareness. 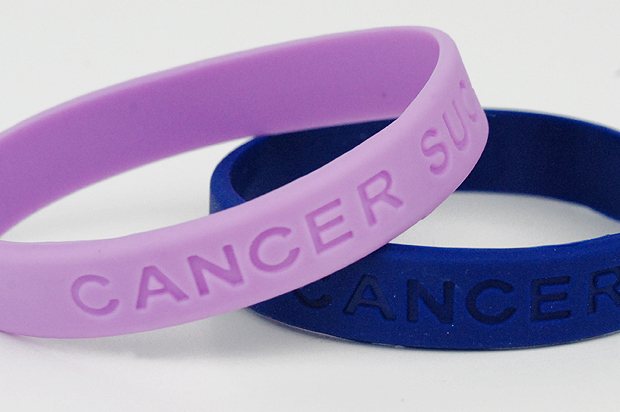 On offer are various types of silicone bracelets in different colours that can help you to make your cancer awareness wristbands stand out from the crowd to make a difference. Lance Armstrong made the cancer wristbands famous by creating awareness against the disease. Most importantly, our professionals can match your awareness bracelets with any colour or theme and in turn can help you to customize them with a unique message. Now you can advertise your events or can promote a cause with the help of awareness wristbands from Make Your Wristbands. So choose the best way to show your support for a particular cause while remaining in fashion by wearing an awareness bracelet. Imprint a cancer awareness wristband with your personalized message today. Get in touch with our experts at 1(800)715-4445 to know more about our services or to place an order today!